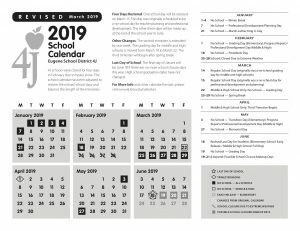 There is a new 4j/Connections calendar because of the days missed due to snow. Please check the link above to make sure you know what the changes are or see the revised 4j Calendar. We do have classes this Thursday and Friday. The new Connection Spring 19 schedule is ready on Friday morning. Please schedule with you case manager or advocate as soon as possible over the next week. Next Thursday March 21 morning classes are taking place as scheduled, but in the afternoon we will be having our Community fun day in downtown Eugene. We will be meeting at LCC Downtown room 308 at 12:30pm to go to Level Up arcade (bring your own money for games or food) and then another super fun activity to be announced. Remember next Friday March 22nd is no school due to progress reports. Then enjoy Spring Break March 25th -29th. Classes resume April 1st – no joke! This entry was posted on Wednesday, March 13th, 2019 at 5:47 pm	and is filed under Uncategorized. You can follow any responses to this entry through the RSS 2.0 feed. You can leave a response, or trackback from your own site.